One distinct factor with clawfoot tubs are, as the name implies, the feet. Not only does the bathtub itself have a rich history, the development of this style of bathing furniture is intriguing. Although the earliest pedestal tub was discovered 3000 years ago, the influential emergence of clawfoot tubs began in the mid 1800’s. As many designs of today, originators of the clawfoot tub took inspiration from the fashion of the day, specifically the furniture style. The ball and claw design was developed in Holland, inspired by a Chinese motif of a dragon clutching a pearl and eventually gained popularity in England and the United States. These feet came in two varying designs; a lion’s paw clutching a ball or an eagle’s claw clutching a ball. The lion style was popular in England whereas the eagle claw was popular in the States. Today, there are several types of feet designs. Popular types include ball feet, paw feet, ball and claw feet, and imperial feet. Between the ball and claw and imperial feet, there are many similarities as both display a claw clutching a ball. 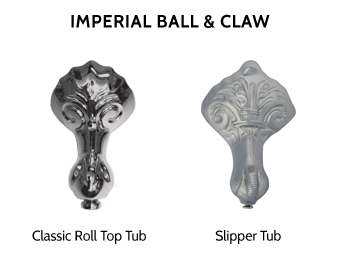 The biggest difference is the ornate design on the imperial ball and claw, which takes inspiration from Chinese designs. Not only do clawfoot tub feet differ in style by type, each type can differ in design by manufacturer. Cast iron tub feet will vary from one tub to the next because of how they are made. 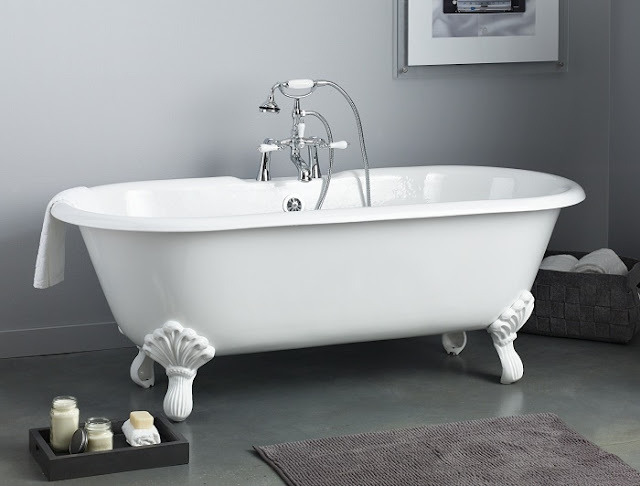 These feet are typically made from cast iron or brass and are formed to the shape of the tub, so each foot has a specific placement on the tub. They are heavier in design to support the weight of the cast iron tub itself. Because of this, the design is larger in comparison to its acrylic counterpart. Acrylic tubs are much lighter, so the feet do not need to be as heavy in design. Many are created from aluminum. Aluminum is more forgiving than cast iron when creating molds, so acrylic tub feet can have very intricate designs. Besides being an interesting design for vintage styled bathtubs, the feet on a clawfoot tub serves an important purpose. It helps the tub to drain. Although you don’t notice it, cast iron tub feet have a set of large feet and a set of slightly smaller feet. The smaller feet are installed at the back to the tub on the drain side. Having a larger foot at the front of the tub and a smaller set at the drain end allows gravity to naturally pull the water to the drain area. Acrylic tub feet have stabilizers underneath that achieve this same functionality without altering the size of the individual feet. This means the feet can be placed at any position on the tub.